Aug. 15 Action against “Safety and Reliability by way of War State” ? 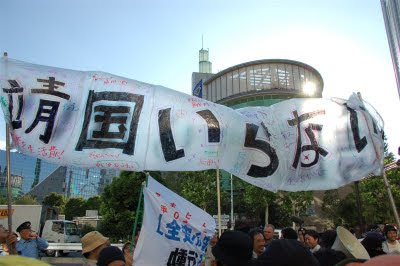 Skylark did not keep its word ‘Never again’ it had said when Mr.
to raise my voice and make utmost efforts for the eradication of karoshi”. Hall located in the Ueno Park, central Tokyo from 2 PM on August 8, 2009. 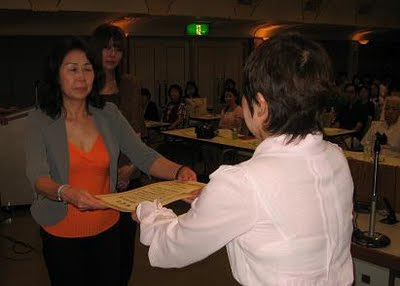 Foundation to support part-time and casual workers in Kanagawa Pref. 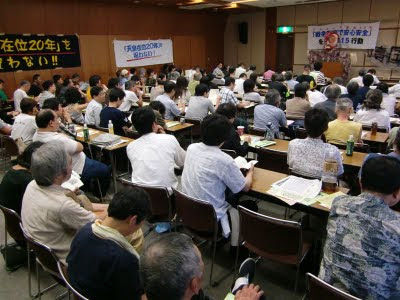 On July 31, the Anti-Poverty Network held a meeting to raise awareness of the Network’s policy challenges to aim towards a more humanistic society that does not allow poverty to further develop in the back drop of the upcoming election. The meeting was called Our Hopes for the Upcoming Election. 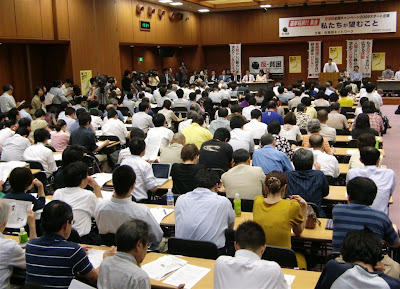 Some 350 participants, including many members from the press, filled the Sohyo Kaikan auditorium at Ochanomizu in Tokyo. 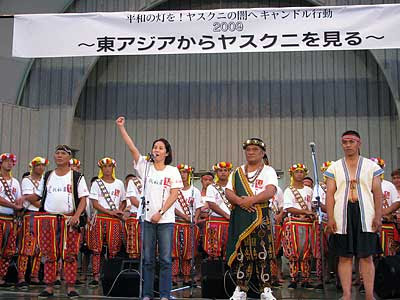 This meeting was called as the kickoff project to start the anti-poverty campaign in 2009. The program was substantial running for two hours and no intermission. 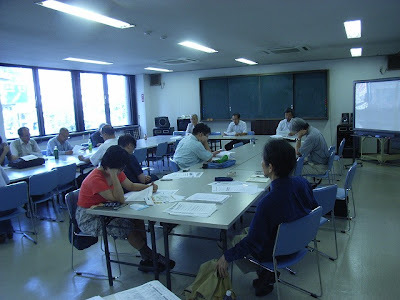 There was an air of excitement as participants listened intently for the whole two hours to the compelling arguments put forward by the speakers, and each party’s diet member (Y, News Team). 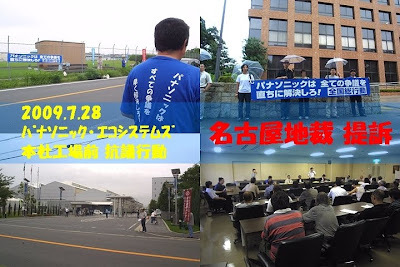 Action against Panasonic held in Aichi: Two Dispatched Workers File to be recognised as Fulltime Workers. 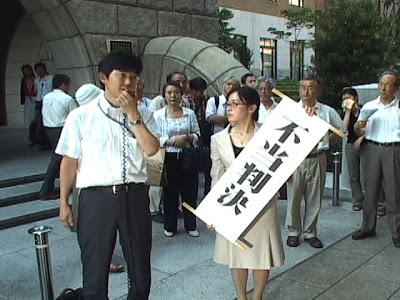 On July 28, an action against Panasonic was held in Aichi as part of the national actions against Panasonic called by plaintiffs Tsutomu Yoshioka against Panasonic Plasma Display, Masako Sato against Fukushima Panasonic Electric Works, and Takeshi Kawamoto against Panasonic Electronics Device Japan. 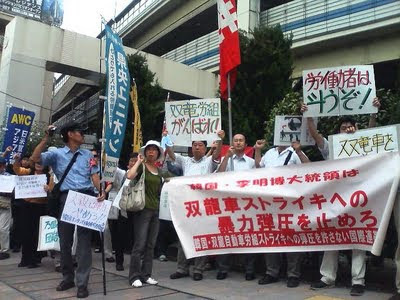 Some 30 people gathered at 7.30 AM to handout leaflets at a speak out at targeting workers at the Panasonic Ecosystems Factory located in Kasugai city. Around 400 leaflets were handed out. At 11 AM, two dispatched workers from Aichi Rentai Union filed a written complaint seeking to have Panasonic Ecosystems confirm its direct hire relations (see photo). 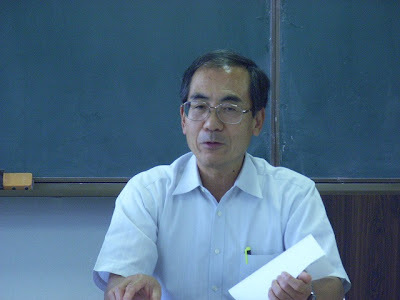 The compliant was written by attorneys Yuji Nakatani and Shin Noguchi and amounted to 38 pages (Report written by Aichi Rentai Union). 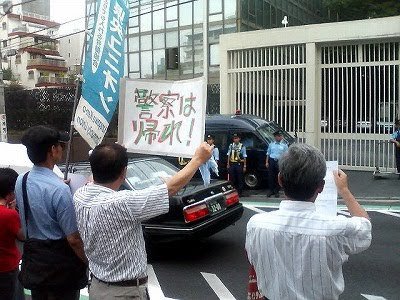 The Japan Staffing Services Association claims that enforcing regulations would mean fewer jobs for dispatched workers. But how true is this claim? It has only been just over six months since we felt the shock felt of seeing the jobless tent city at the start of the year. Despite this, both the ruling and opposing parties have stalled on the Dispatched Employee Law and we are back at square one. The dispatched services industry is active in blocking any regulation. 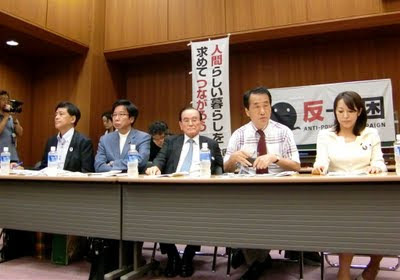 In the midst of a potential change of government, newspapers have reported that the industry bigwigs have attempted to influence Diet members in the Democratic Party. We can no longer stay silent about this watching from the sidelines. 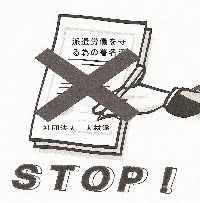 We need your support to get 100,000 signatories for more regulation to protect dispatched workers in opposition to the petition being organised by the Japan Staffing Services Association to block any regulation of the industry. 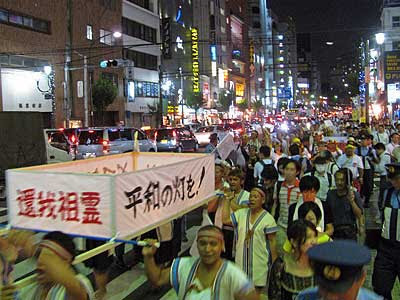 On August 5, we protested the Japan Staffing Services Association and had a cosplay march of anger. The rebellion by female dispatched workers will continue until we see the realization of further restrictions in the Dispatched Employee Law. (Written by Action Center for Working Women).